I was born 1 June 1961 in a small village among forests 100 kilometers south of Perm*. After 1965 my parents and my brother and I lived near Perm. I remember in 1969, when I was only eight years old, we were told that Americans had landed on the Moon. It was interesting; but there were many other things to interest a boy in summer. However, in school I started to read books about astronomy, aviation, and cosmonautic. In 1976 I bought a book about the records of manned spaceflights. It contained some interesting details. For me, the most exiting fact was that the Saturn V rocket burnt 15 tons of fuel and oxidizer per second at lift off. I also remember that, about a year later, when I should have been listening to my history teacher, I made a drawing of the lunar module. Suddenly, I remembered my spacecraft book and read it again. Since that time I have read everything about spaceflight that I could find. By the time I finished school in 1978, I decided that I wanted to find work related to rockets or, at least, aircraft. So I began to study radio and electronics at the Kazan Aviation Institute (now the Kazan State Technical University). Very soon I found in the Institute library copies of the "Spaceflight" journal published by British Interplanetary Society. But I could only look pictures because at school and at the Institute I studied German. In 1985 I bought a book for self-teaching of English and studied it for 15 months. That let me read "Spaceflight" with a dictionary. I began to use the Internet in 1996; and in 1999 I found the Apollo 15 Flight Journal and, then, the Apollo Lunar Surface Journal. Because the Internet via dial up was very slow and expensive, I copied the Journal text files and printed them for reading. To see the pictures, in 2002 I bought the Apollo Lunar Surface Journal CD set from Ken Glover. Since 2010 I read Apollo Lunar Surface Journal nearly every day about 20 minutes after a diner. And I read many more equipment manuals and datasheets for the electronic components in English.Two years ago I finished reading the Surface Journals and began to read the Apollo 8 Flight Journal and am currently reading Apollo 12. It is more interesting to read both the Surface and Flight Journals together. In 1984 to 1989 I had a job in the manufacture of the electronics for the Energia rockets. After that program ended we began to produce equipment for the telephone networks. I have written several books and articles about my vision of the rational and optimal way of development of this network and even try to translate them in English. 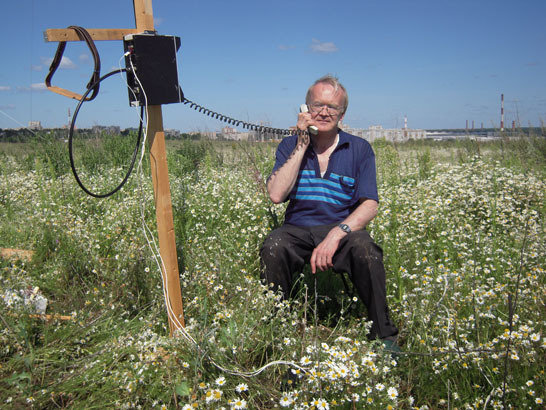 The photo shows me at a 7 July 2012 VHF Field Day Contest for radio amateurs. I cannot give a specific reason for my interest to the Apollo program. It is something inside me. The flights to the Moon are the farthest journeys of man - yet - and the Saturn V is the mightiest rockets in the world. Having read the Apollo Lunar Surface Journal, I understood the difficulties of work on the Moon and how exciting it was. *Perm is a city of about 1 million on the Kama River, just west of the Urals.